Our guests say, Cerne Abbas is England's most beautiful village. This country residence has become their holiday home and they look forward to returning every year. We are pleased to share this special place with you. Old Gaol Cottage is a checkered stone listed building of character built in 1859. It originally served as the jail and police station from 1860-1954 and is situated in the picturesque village of Cerne Abbas, famous for its 2000 year old Cerne giant carved into the chalk hillside. Flanked by the 'old court' and 'sergeant's quarters', this mid - terrace cottage has been lovingly restored and professionally decorated. The English Tourism Board has awarded the cottage a rare 'five - star' rating for ten years. In 2008, Cerne Abbas has been deemed Britain's most sought after village by the estate agent, Savills. The Old Gaol Cottage was featured in E-Motion Magazine's ' Top 10 of the very best quirky places to stay' in England. Cerne Abbas is located 8 miles North of Dorchester, our market town, and 15 miles from Weymouth Harbor, site of the 2012 Olympic Sailing Regattas. The village, with a population of about 750 people, has an impressive array of shops including three fine pubs, tearoom, grocery store, post office and several gift shops. Many historical sites are within a five minute walk from the cottage: the remains of the Benedictine Abbey founded in 987 AD, a fourteenth century tithe barn and Abbey Guest House, St. Rates are subject to change please Conant owner for correct pricing! Augustine's Well, circa 600 AD, and St. Mary's Church, built about 1300 AD. On Abbey Street is the finest row of Tudor homes in Dorset. One of these, The Pitchmarket, was home to Thomas Washington -- uncle of George Washington. More historical information can be obtained by the Cerne Abbas Historical Society. The countryside is excellent for walking, with many footpaths and bridleways over the chalk hills and through secluded valleys. A short drive to Dorset's Jurassic coast with World Heritage Site status. A fossil hunters paradise with it's dramatic cliffs, pebble beaches & shelter coves awaiting exploring. Weymouth harbor, 30 minute drive is the site for the 2012 Olympic Sailing Regatta events. Jan and David Kirkpatrick, Old Gaol owners, live in Charlotte, NC in America when not in residence in the UK. Cerne Abbas truly is the most beautiful village in England. The countryside provides many wonderful walks and returning to a comfortable cottage just completes the day. 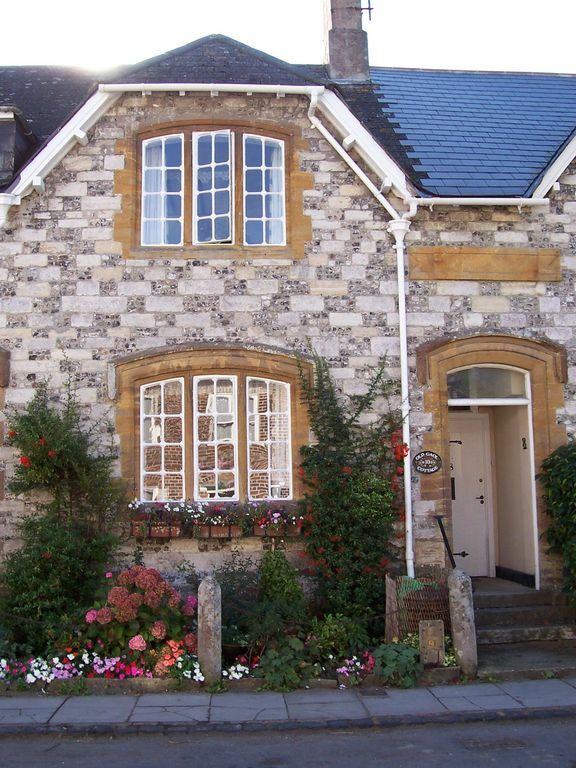 This location in the heart of Dorset is a great way to take easy drive day trips throughout the surrounding area. We have found the villagers most welcoming and many have become dear friends. The village is filled with many historical homes and landmarks. Most often, the guest comment on how comfortable the beds are. All the furniture are family pieces shipped from America. (Though, many were originally made in England) The cottage was furnished not as a holiday let but rather our UK home. Container garden in rear of property. We had a great holiday and it was a pleasure to stay in such a lovely holiday home . It was very well equipped and in a lovely village . Thank you for your kind comments. It is a great complement to Jan who restored the cottages back to health 20 years ago and continues to make the cottage a comfortable home for all of us to enjoy. Do hope you will return again. Warm and cosy, with well equipped kitchen. Furnished to a high standard. Bedrooms were large with comfortable beds. Excellent position in lovely village with great pubs. Local shop had fresh bread and everything you could need for a holiday cottage. It's a place we would love to go back to! A new experiences all the time! Another superb holiday here in Cerne Abbas. We are retuning home thoroughly chilled out and relaxed and very sad to go. Old Gaol Cottage is our Dorset home from home for the past eight summers.. Superbly equipped, cozy and comfortable. The surrounding countryside is so beautiful and tranquil. See you again next year. Thank you! We have thoroughly enjoyed our holiday in England and most especially in Cerne Abbas. Everyone has been friendly and gracious. The Cottage is beautifully decorated. It has been comfortable & relaxing. It has given our souls a needed rest from our hectic lives. Thank you for allowing us to enjoy your English home. Historic Houses & Gardens - (Athelhampton, Mapperton, Sherborne Castle, Kingston Lacy & Forde Abbey), Cathedrals , (Salisbury, Winchester & Wells), Stonehenge, Fossil Hunting, Swannery, Sub-Tropical Garden, Steam Train Railroad, Roman Town House, Corfe Castle, Hill Fort at Maiden Castle, Museums (Military Tank & Fleet Air) - Haynes Motor Museum, County Fairs - May & September, Lawn Bowling, Snooker, Cricket, Football, Horse Race Courses (flat & steeple events), Site of 2012 Olympic Sailing Regattas in Weymouth harbor. Pricing is subject to change based on seasonal rates. Our range of weekly prices varies from 400 GBP to 852 GBP. Please call or email us with your requested dates for a quote Cancellation Policy In the event of you cancelling your holiday and you either have no insurance provision or the policy you have does not cover your reason for cancelling you must still pay the full cost of the holiday to The Company. In such cases The Company will make every effort to re-let the property for the period booked. If successful a refund of monies will be paid less an administration charge of £40 plus our booking fee and any banking / credit card charges associated with the booking. A deduction will also be made if the rebooking is subject to any promotional price reduction or if it is for a shorter period the application of such is at the sole discretion of the company. If the Company is unable to re-let the property then as stated above you will be liable to pay The Company the full cost of the holiday.